Since it's a bar you type in to create a results list based on incremental search terms, you'd be forgiven for confusing LaunchBar with Spotlight. But LaunchBar is so much more than Spotlight, which has a sole trump card in its ability to search within files. Elsewhere, LaunchBar rules the roost. For example, you can train an item to launch using your preferred characters, and LaunchBar offers categories, enabling you to select a result type – JPEGs, phone numbers, ZIP archives and more – and search within that list. LaunchBar further obliterates Spotlight with actions. After making a selection, you can manipulate an object using commands you'd associate with Finder (Copy, Move, Compress) or custom AppleScripts. Certain apps also have associated actions – you can control iTunes entirely from within LaunchBar, or learn some basic syntax to create new iCal appointments. 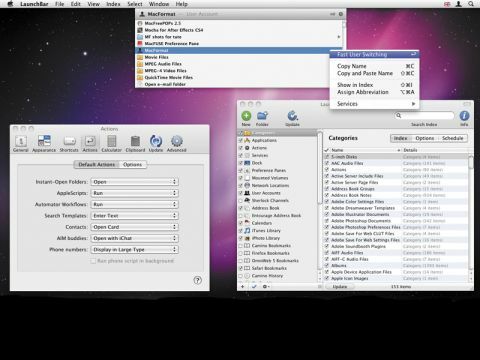 Along with Snow Leopard support, this latest release brings two further standout features. The first is Quick Look support, enabling you to preview any selection directly from the results list. Even better, there's multiple clipboard support. The capacity is up to 40 items and you can merge clips; system-wide shortcuts provide fast access to your clipboard history within LaunchBar. LaunchBar is rock solid in general use and delivers great functionality. The only downside is that it's a tad tricky to master. But persevere and you'll find it an essential install.